We’d love your help. Let us know what’s wrong with this preview of The Assassin by Clive Cussler. Detective Isaac Bell tracks a killer across the nation’s oilfields in this adventure in the #1 New York Times–bestselling historical series. As Van Dorn private detective Isaac Bell strives to land a government contract to investigate John D. Rockefeller’s Standard Oil monopoly, the case takes a deadly turn. A sniper begins murdering opponents of Standard Oil, and soon the Detective Isaac Bell tracks a killer across the nation’s oilfields in this adventure in the #1 New York Times–bestselling historical series. As Van Dorn private detective Isaac Bell strives to land a government contract to investigate John D. Rockefeller’s Standard Oil monopoly, the case takes a deadly turn. A sniper begins murdering opponents of Standard Oil, and soon the assassin—shooting with extraordinary accuracy at seemingly impossible long range—kills Bell’s best witness. Then the shooter detonates a terrible explosion that sets the victim’s independent refinery ablaze. To ask other readers questions about The Assassin, please sign up. why is isaac looking at other women--isn;t he happily married to marion morgan ? Have his books gotten better latery? I was a fan, until the co-authored books started coming out, which I did not like. One of the better books in the Isaac Bell series(#8) this time Isaac is hired by Standard Oil to protect John D. Rockefeller himself from a lethal assassin. This one has a twist you won't see coming! My only complaint is that it's another prequel, but I guess I'm in the minority because the next one is a prequel as well. As I've mentioned before, I'm not a fan of history - as in the classroom learning of it. I do, however, enjoy learning how things that happened in the past impact the way we all live and work today as well as details that likely won't be included in any history textbook. My first and only experience with this series featuring James Bond-like private detective Isaac Bell, The Striker, was a pleasant one (like this one, I gave it, the sixth, 4 stars back in April 2013). But books by too many other As I've mentioned before, I'm not a fan of history - as in the classroom learning of it. I do, however, enjoy learning how things that happened in the past impact the way we all live and work today as well as details that likely won't be included in any history textbook. My first and only experience with this series featuring James Bond-like private detective Isaac Bell, The Striker, was a pleasant one (like this one, I gave it, the sixth, 4 stars back in April 2013). But books by too many other favorite authors intervened (including several of the author's Dirk Pitt novels), and I somehow never got around to reading another until now. And I admit I probably should have read the 7th (The Bootlegger)before tackling this one, although from my perspective it stands well on its own. I've read other reviews, though, claiming that questions and situations happening in the previous book were either left unresolved or not included here at all, leaving them to wonder why the oversights. But I also learned (after the fact) that this book is set four years prior to the first book of the series (The Chase, 2008), which certainly could account for seemingly left-out references. That said, I really enjoyed this one, despite more than a few situations that seemed a bit over the top (a hot air balloon incident, for instance). The plot, set in the late 1890s and early 1900s, centers on an attempt to bring down oil magnate J.D. Rockefeller and his all-powerful Standard Oil. I wasn't around back then, but I do remember Standard Oil, and the cities of Cleveland and Oil City, Pennsylvania, where at least some of the action takes place, are less than a couple of hours from my northeastern Ohio home (and I've spent time in both). The book begins as an assassin begins to murder opponents of the huge oil conglomerate, one of whom is Bell's best witness in his company's investigation of Standard Oil's monopoly. That's followed by the sniper's detonation of an explosion that destroys the witness's independent refinery. The chase to find the diminutive assassin leads Bell around the world, from New York to the Midwest to the vast oil fields of Russia and puts the detective in many life-threatening situations that put his mental and physical skills to the test. Historical details are abundant, but at no time did I feel that they overwhelmed the story; in fact, they added to it and, whether they were fact or fiction, to my enjoyment of the book as well. Heck, I even learned a new word: inveigle. In case you're wondering too, it means to convince someone else to do something through coaxing and/or flattery. Another very enjoyable book in the Issac Bell series! Interesting since I lived near the JD Rockefeller estate on NY and now live in Erie,PA near Oil City. As with all Cussler books, non-stop action from start to the end! The most engaging mystery I've read in a while. With plenty of twists and turns, a charming historical setting, and wonderfully crisp writing, it's easy to see why Clive Cussler's books continue to sell like hotcakes. I am such a sucker for an Isaac Bell adventure. Another great roller coaster ride all over the freaking globe. I actually listened to this on a 600 mile road trip to Maine and back. There is nothing better than listening to Scott Brick read a Clive Cussler novel. What a cool way to start and end a vacation! As always, purchase and enjoy! This is the eighth book in the Isaac Bell Adventure series. The story is set in 1905 and is about John D. Rockefeller and the Standard Oil monopoly. Isaac is working to find proof of wrong doing by Standard Oil but becomes a bodyguard to Mr. Rockefeller when someone starts killing off other oil men.The action is fast paced for the time and moves overseas at times. The book was won by me as a First Reads from Goodreads. It was a fast and easy read. Another enjoyable read from the Isaac Bell stable of books. I suspect even more enjoyable for my american friends who can relate to the locations and the history involved in the John D Rockefeller oil baron era of American history better than I can. Fast-paced action and adventure with settings all over the globe - and of course Isaac Bell to save the day! Everything you expect from Cussler, fast action, neat locations, exotic cars and historical tidbits scattered throughout. I really enjoyed this book, and while it was not my favorite in the series it did not disappoint. You can never go wrong with Clive Cussler. Another good read by Cussler and Justin Scott. I haven't researched the history of Standard Oil and John D Rockefeller but the book centers around JDR and what an industrial tyrant he was. Once again Issac Bell comes to the rescue. It was an interesting read and full of historical facts about the wildcat business in the early 1900's. A good read that keeps the pages rolling. “On the Jump” drama - High-octane suspense – Rough-n-tumble action. An Isaac Bell historical adventure encompassing Black Gold, J.D. Rockefeller, and an assassin’s revenging deadly rampage. All the inventive page-turning action one expects from the master of adventure-thrillers – Clive Cussler. From Pennsylvania, to Kansas, to Texas, DC, and the oilfields in Russia on the Caspian Sea, via Locomobile, horses, hot air balloons, trains, and ships; the action didn't stop as the pages flew by with Cu “On the Jump” drama - High-octane suspense – Rough-n-tumble action. An Isaac Bell historical adventure encompassing Black Gold, J.D. Rockefeller, and an assassin’s revenging deadly rampage. All the inventive page-turning action one expects from the master of adventure-thrillers – Clive Cussler. From Pennsylvania, to Kansas, to Texas, DC, and the oilfields in Russia on the Caspian Sea, via Locomobile, horses, hot air balloons, trains, and ships; the action didn't stop as the pages flew by with Cussler's twisting plot, transporting imaginary, era-specific nuances, and tidbits of fascinating historical intrigue. Naphtha being one tidbit that had me researching Assyrian/Biblical history and the use of flaming arrows. One thing that threw me off kilter a bit, at least the first chapter or so, The Assassin #8 in series, is out of chronological ‘date’ sequence; set in 1906 during Bell’s young and wily bachelor days. But it was rather fun experiencing Bell in a youthful light after I acclimated to the switch-up. And there were a couple far-reaching scenarios that pushed the boundaries of plausibility, but nothing so glaring as to make me roll my eyes in total disbelief. Besides, stretching one’s imagination is part of the fun. This ia another Goodreads book and it was a good read. I have read a few other Isaac Bell books and was a little confused that his wife seemed to be missing. This was a recurrent thought as I continued to read but was explained in the last chapter. I had to go back over the prologue a few times to understand what was happening but from the first chapter on it was a continuous great read. The action was fast with just a little pause between events. I stayed up late to finish this great story and lo This ia another Goodreads book and it was a good read. There’s action galore in this thriller about oil tycoon John D. Rockefeller. Isaac Bell finds himself in the middle of a case involving a sniper, shady dealings, big business, poisoning, accidents that really aren’t accidents, a missing man, and pretty women, not to mention foreign intrigue and suffragists. Will Bell solve the case before it all blows up – literally – in his face? Great characters and a plot that rushes on through all 400 pages makes this tale an exciting page-turner. love clive cussler just can't put it down. a great read with great characters and great narrator. Det. Isaac Bell is eager to secure an important government antitrust contract to investigate John D. Rockefeller's Standard Oil monopoly. Then a killer picks off Bell's key witness and blows up the man's independent refinery—just the beginning of the shootings, poisonings, and staged accidents that darken the narrative. This is a first read edition from Goodreads. What a theory Isaac Bell against Standard Oil and a deadly assassin. Bell is now on a goverment contract to investigate John D. Rockefeller's Standard Oil monopoly. An assassin kills one of Bell's witnesses. This is a fast paced, page turner. I enjoyed some of Bells other stories better, but all in all it was a good read. An interesting story. It was a good book. I liked it a lot. It was full of action/adventure. It was a well written book. I look forward to reading more books by this author. The 8th book written regarding the private operative of the Van Dorn Detective Agency, Isaac Bell. As Bell tries to capture a sniper taking out the opponents of John Rockefeller's Standard Oil even as he investigates and travels with Rockefeller to the oil fields of Russia with Bell stopping in Kansas, Texas, Washington, DC and New York City. There is a bit of romance as Bell is equally attracted to the lovely daughters of a former wildcatter. Interesting - as this is his historical operative rathe The 8th book written regarding the private operative of the Van Dorn Detective Agency, Isaac Bell. Interesting - as this is his historical operative rather than one that takes place in the current time - you have to be torn between a mild longing for the slower pace - everything took more time be it transportation via railroad or ship, communications via telegraph hoping the receiver would be at the location the massage was sent, news from across the world weeks or months ago even as you get equally frustrated with how slow any progress in identifying and capturing the sniper is made. Instantaneous communication only occurs in the same room. And, since it is a Cussler novel, there are antique cars, bites of history with travelling and learning about different areas and - in this case - the questionable practices used by the industrial tycoons at the end of the 19th-beginning of the 20th century as they increased their business, even pushing out the smaller concerns that would get in their way on influence, power and wealth. 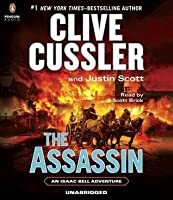 The Assassin by Clive Cussler with Justin Scott is the eighth book in the Isaac Bell Adventure series. It is a gripping fast and easy read, full of adventure, action, mystery, thrill and suspense. Though The Assassin is a co-written book, there is Cussler’s trademark presence all over it. The story is set in 1905 and is about John D. Rockefeller and the Standard Oil monopoly. Isaac Van Dorn, a detective who works for an agency, is sent to find who is blowing up railways in the west. 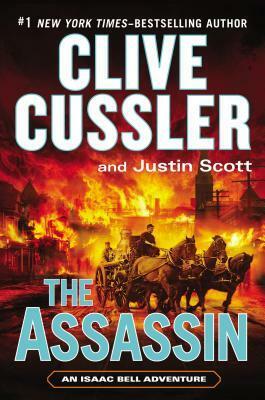 Isaac is inve The Assassin by Clive Cussler with Justin Scott is the eighth book in the Isaac Bell Adventure series. It is a gripping fast and easy read, full of adventure, action, mystery, thrill and suspense. Though The Assassin is a co-written book, there is Cussler’s trademark presence all over it. The story is set in 1905 and is about John D. Rockefeller and the Standard Oil monopoly. Isaac Van Dorn, a detective who works for an agency, is sent to find who is blowing up railways in the west. Isaac is investigating to establish if there is something amiss about Standard Oil but by a twist of fate becomes a bodyguard to Mr. Rockefeller when a sharp assassin started killing off Standard Oil’s rivals. Although this was book #8 in the series, it went back in time, portraying a younger Isaac Bell before he had met Marion and the events of "The Bootlegger" had taken place. That threw me off track for a bit, (since I had seriously JUST read about Isaac's wedding in book 7!) until I got into the swing of the story. A redeeming factor is that Isaac's character is written the same. I especially love his interactions with the boss (VanDorn) and his college buddy Archie. But the plot was a hot mess to Although this was book #8 in the series, it went back in time, portraying a younger Isaac Bell before he had met Marion and the events of "The Bootlegger" had taken place. But the plot was a hot mess to me. I thought the assassin character was cleverly done and revealed at the end, but some of the supporting cast were too distracting. Chiefly among my list of complaints is Isaac's not-quite-relationship with Edna Matters and maybe even her sister Nellie too! This is the the first Clive Cussler book I have read and it certainly won't be my last. Being book 8 in the Isaac Bell series, at no point does it feel like I need to have read the previous entries in the series. I'm sure once I have read more I will pick up subtle references to other events in the series. The Assassin is a great action packed, noir styled detective adventure. There is a great mixture of history (1900's oil business in America and Russia), detective work and explosive action that This is the the first Clive Cussler book I have read and it certainly won't be my last. Being book 8 in the Isaac Bell series, at no point does it feel like I need to have read the previous entries in the series. I'm sure once I have read more I will pick up subtle references to other events in the series. There is a great mixture of history (1900's oil business in America and Russia), detective work and explosive action that make for an easy to read page turner with plot twists aplenty. Main character Isaac Bell comes across as a James Bond-esque hero with a good, if not quite so well fleshed out supporting cast. I always find it hard to just read the dang books without looking up historical facts. There is a whole section in "Book Three" that could be cut out and the story would flow just as well, if not better. Cussler takes it upon himself to make Rockefeller such an important character that he has lines and a place in Bell's case. When fiction mixes with real history, it can become distorted in what really happened. It also lends to real figures doing things they never did, or would never have done. I always find it hard to just read the dang books without looking up historical facts. There is a whole section in "Book Three" that could be cut out and the story would flow just as well, if not better. Cussler takes it upon himself to make Rockefeller such an important character that he has lines and a place in Bell's case. When fiction mixes with real history, it can become distorted in what really happened. It also lends to real figures doing things they never did, or would never have done. This is the section I think Cussler could have left out without compromising his story line. This is not number 8 in the series! It might have been the 8th book written, but this Falls early on in the Isaac Bell story :-(I wished it was listed chronologically. This book has Aloysius still working for Van Dorn, Isaac unmarried and still flirting, and other early on events. It really is before all the others out, including the first. It's a great place to start the series even. I would recommend this book to anyone as a starter, or as book 2 perhaps. Don't go until he's met Marion, or it This is not number 8 in the series! It might have been the 8th book written, but this Falls early on in the Isaac Bell story :-(I wished it was listed chronologically. This book has Aloysius still working for Van Dorn, Isaac unmarried and still flirting, and other early on events. It really is before all the others out, including the first. It's a great place to start the series even. I would recommend this book to anyone as a starter, or as book 2 perhaps. Don't go until he's met Marion, or it is a little weird that he has the hots for these other girls. Fast-paced read about regional and international intrigue in the oil business during the early 20th century. Cussler's unflappable detective, Isaac Bell, and the Van Dorn Agency move heaven and earth to figure out who's creatively killing opponents of Standard Oil, John D. Rockefeller's behemoth oil company. An interesting cast of characters that bring to light political and national conflicts of the day. The nascent roots of modern companies are revealed for people wanting to see where modern co Fast-paced read about regional and international intrigue in the oil business during the early 20th century. Cussler's unflappable detective, Isaac Bell, and the Van Dorn Agency move heaven and earth to figure out who's creatively killing opponents of Standard Oil, John D. Rockefeller's behemoth oil company. An interesting cast of characters that bring to light political and national conflicts of the day. The nascent roots of modern companies are revealed for people wanting to see where modern companies came from. Issac Bell is investigating one of the most powerful and wealthy men in the country, but he stumbles upon another plot in the mix - one that involves a very successful assassin. While trying to find the murderer, he meets two beautiful and talented sisters, and it may just be harder to decide which of the two ladies he is falling in love with, than to find his man. An exciting adventure, with lots of twists and turns. Very reminiscent of the first few Isaac Bell novels. I thoroughly enjoyed it : Issac Bell is investigating one of the most powerful and wealthy men in the country, but he stumbles upon another plot in the mix - one that involves a very successful assassin. While trying to find the murderer, he meets two beautiful and talented sisters, and it may just be harder to decide which of the two ladies he is falling in love with, than to find his man. Cussler began writing novels in 1965 and published his first work featuring his continuous series hero, Dirk Pitt, in 1973. His first non-fiction, The Sea Hunters, was released in 1996. The Board of Governors of the Maritime College, State University of New York, considered The Sea Hunters in lieu of a Ph.D. thesis and awarded Cussler a Doctor of Letters degree in May, 1997. It was the first time Cussler began writing novels in 1965 and published his first work featuring his continuous series hero, Dirk Pitt, in 1973. His first non-fiction, The Sea Hunters, was released in 1996. The Board of Governors of the Maritime College, State University of New York, considered The Sea Hunters in lieu of a Ph.D. thesis and awarded Cussler a Doctor of Letters degree in May, 1997. It was the first time since the College was founded in 1874 that such a degree was bestowed. Cussler is an internationally recognized authority on shipwrecks and the founder of the National Underwater and Marine Agency, (NUMA) a 501C3 non-profit organization (named after the fictional Federal agency in his novels) that dedicates itself to preserving American maritime and naval history. He and his crew of marine experts and NUMA volunteers have discovered more than 60 historically significant underwater wreck sites including the first submarine to sink a ship in battle, the Confederacy's Hunley, and its victim, the Union's Housatonic; the U-20, the U-boat that sank the Lusitania; the Cumberland, which was sunk by the famous ironclad, Merrimack; the renowned Confederate raider Florida; the Navy airship, Akron, the Republic of Texas Navy warship, Zavala, found under a parking lot in Galveston, and the Carpathia, which sank almost six years to-the-day after plucking Titanic's survivors from the sea. In September, 1998, NUMA - which turns over all artifacts to state and Federal authorities, or donates them to museums and universities - launched its own web site for those wishing more information about maritime history or wishing to make donations to the organization. (www.numa.net). In addition to being the Chairman of NUMA, Cussler is also a fellow in both the Explorers Club of New York and the Royal Geographic Society in London. He has been honored with the Lowell Thomas Award for outstanding underwater exploration. Cussler's books have been published in more than 40 languages in more than 100 countries. His past international bestsellers include Pacific Vortex, Mediterranean Caper, Iceberg, Raise the Titanic, Vixen 03, Night Probe, Deep Six, Cyclops, Treasure, Dragon, Sahara, Inca Gold, Shock Wave, Flood Tide, Atlantis Found, Valhalla Rising, Trojan Odyssey and Black Wind (this last with his son, Dirk Cussler); the nonfiction books The Sea Hunters, The Sea Hunters II and Clive Cussler and Dirk Pitt r Revealed; the NUMA® Files novels Serpent, Blue Gold, Fire Ice, White Death and Lost City (written with Paul Kemprecos); and the Oregon Files novels Sacred Stone and Golden Buddha (written with Craig Dirgo) and Dark Watch (written with Jack Du Brul).